It’s probably the toughest six letter word to ever hear… Cancer. It is something that is diagnosed and something that we have to deal with. How you and your loved ones deal with it is the burning question. It can take a mental and physical toll on you and your family. While we are all hoping that research can quickly find a cure for Cancer, there are some steps that you can take to help the fight now. Research indicates that physical activity after a diagnosis of breast cancer may be beneficial in improving quality of life, reducing fatigue and assisting with energy balance. Both reduced physical activity and the side effects of treatment have been linked to weight gain after a breast cancer diagnosis. One study found that women who exercised moderately (the equivalent of walking 3 to 5 hours per week at an average pace) after a diagnosis of breast cancer had improved survival rates compared with more sedentary women. The benefit was particularly pronounced in women with hormone responsive tumors. Another study found that a home-based physical activity program had a beneficial effect on the fitness and psychological well-being of previously sedentary women who had completed treatment for early-stage through stage II breast cancer. That’s some straight science for you, but I know that every person is built differently. I can tell you that in my 27 years of personal training, I have met and trained many people with breast cancer and/or ovarian cancer diagnosis and one common theme came to light. Being fitter and feeling stronger gave them more confidence about themselves. Try weight bearing exercises to firm your muscles and cardio activity to keep your heart strong. A strong soldier is a fighting soldier! Everything starts with the mind. Get in the mindset to fight and not to succumb to this beast of Cancer. It takes a fit entourage to help you in this journey so not only should the person diagnosed get fit but family members and friends should as well. Make your team a strong team! In 2010, I received my certification as a Breast Cancer Awareness specialist. This certification helped me get a better understanding of how to discuss breast cancer with my clients and more importantly, develop a workout plan suited for them and their situation. Let’s get FIT to FIGHT! Let Mr. B.-FIT and his staff help you and your family with the tools to overcome a huge challenge… CANCER. “I spoke to my team of physicians @Helen Graham about the importance of nutrition & exercise after my breast cancer diagnosis, surgery, treatment and in survivorship. They told me that studies indicated that physical activity after a diagnosis of breast cancer were beneficial in improving quality of life, reducing fatigue and assisting with energy balance. They told me that reduced physical activity and the side effects of treatment were linked to weight gain. They also said that women who exercised after a diagnosis of breast cancer had improved survival rates as compared with those that didn’t. Everyone can benefit from a healthy lifestyle, but it’s especially important for breast cancer survivors. Living healthier can lower the risk of breast cancer recurrence and improve the rate of survival. So, I got their approval to exercise & put my plan into action of becoming a “healthier me”. First, I contacted a variety of gyms, exercise classes, certified trainers & instructors to gather information. It was important to me to find someone who had a cancer and exercise training certification. Someone who knew the specifics of working with individuals that had been diagnosed with breast cancer. 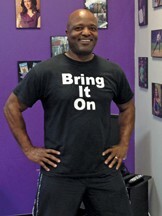 I decided to give B-Fit Enterprises a try and I am glad I did. Next Story → How Can I Lose Weight And Feel Great?